Smaller serving plates can make a big difference in your kid’s life, especially when it comes to the growing problem of obesity. Obesity is a growing concern in the US, with kids, teens and adults all affected by it. According to a previous study published in JAMA, quoting 2009-2010 data, one in three adults and one in six US children and teens in US are obese. A 2012 study also found out that children can be less obese if parents take the pressure off from kids about their eating habits. Researchers from Temple University looked at the plates in which food is served rather than the eating habits of kids and found that kids who use larger plates to eat, serve themselves more and consume nearly half of the calories they served, resulting in greater energy intake at mealtimes. The team found that modern Americans were eating in larger dish sizes than in the past resulting in more food per meal per plate. This was leading to kids becoming used to more food and gaining more weight. For the small study the team studied 42 first grade students. For the lunch at school, the kids served themselves an entree and side dishes using either child- or adult-size dishware. The team observed that when kids served themselves in the adult sized plates, they consumed 90 to 104.2 calories more than children using small plates, depending on whether or not they enjoyed the meal available. 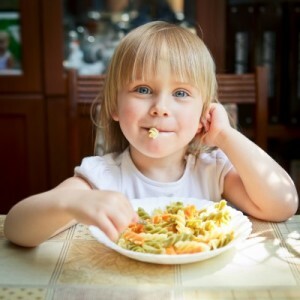 “We know large portions have a pretty consistent effect in making kids eat more than they would if the portion sizes were smaller,” said Jennifer Orlet Fisher, co-author and an associate professor of public health at Temple University in Philadelphia. Each extra calorie served caused a 0.43-kcal increase in total energy intakes at lunch. The study also found that the kids served themselves more fruits but not more vegetable when the dish size was larger. Also child’s Body Mass Index (BMI), gender, and weight did not have a notable impact on the results. The researchers thus conclude that if parents use smaller dish sizes at homes, the portion sizes will be reduced to becoming appropriate to a child’s needs and not overly filled with food. This may help tackle the problem of obesity in the long run.